Marine sponges are important members of marine ecosystems as they serve as biofilters that can clean the surrounding waters. These sedentary organisms are not autonomous entities but rather provide refuge for both macroorganisms and microorganisms or what are called symbionts. The intimate relationship between sponges and their symbiotic microbes is important for the health of both the host sponge and the symbionts. There is a growing literature that shows how important symbiotic microbes are for the survival and adaptation of their hosts. There are even studies that point to the role of microbial symbionts in the ability of sponges to adapt to climate change. But just like any other relationship, this association can be affected by the environmental disturbances that cause the breakdown of the interactions between the sponges and microbes. This, in turn, can influence the function of the association and, subsequently, the health, abundance and distribution patterns of the host sponge. Previous studies have examined the relationship against variables such as elevated temperature, sedimentation and tidal exposure. But very little research has been done on the effects of nutrient enrichment on the partnership. 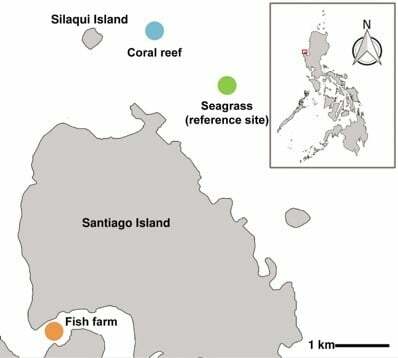 To directly assess the influence of nutrient levels on the microbial community of a sponge, Dr. Cecilia Conaco and Jake Ivan P. Baquiran of the Marine Science Institute in UP Diliman transplanted fragments of the marine sponge Gelliodes obtusa from its natural habitat in a seagrass bed to a nutrient-rich (eutrophic) fish farm as well as to a nutrient-poor (oligotrophic) coral reef site in Bolinao, Pangasinan. Sponge fragments grown at the fish farm exhibited the greatest increase in length after several weeks compared to fragments from the other sites. The microbial community diversity did not change significantly upon transplantation to fish farm. However, more copies of the ammonia monooxygenase gene, a bacterial enzyme involved in ammonia oxidation, were detected in the fish farm sponges, indicating a response to elevated ammonium levels in the area. The stable association between G. obtusa and its microbiome indicates that the sponge and its associated microbes can withstand nutrient over-enrichment (eutrophication) pressure from the extensive fish farm activity. This study reveals the stable association of the sponge Gelliodes obtusa with its associated microbial community even under eutrophic conditions. The ability of the sponge and its microbes to thrive in a high nutrient environment highlights their resilience to eutrophic stress. 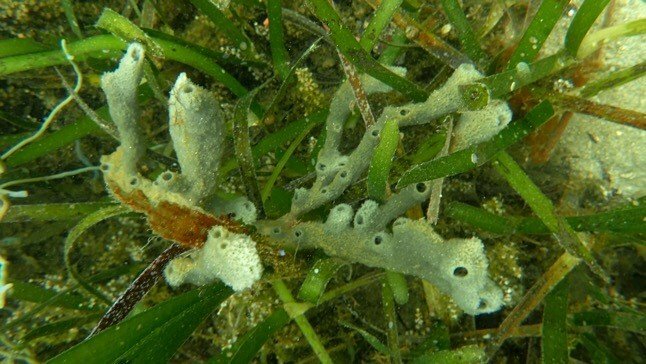 The findings of the study point towards the potential applications of this sponge or the microorganisms within its tissues in the clearance of organic matter and nutrients from mariculture areas affected by organic pollution. This sponge may act as a biofilter for sea-based culture or as sponge farms in integrated multitrophic aquaculture to minimize pollution from fish farming activities. In addition, the resistance of the sponge-associated microbial community to invasion of opportunistic microbes even under poor water quality conditions suggests that the community includes members that can produce antimicrobials, which makes G. obtusa a potential source of these bioactive compounds. The findings were reported in Marine Pollution Bulletin, which has an impact factor of 3.241.